With the holidays coming up, most of my shopping budget is set aside for presents. So I love when I spot something that will go far towards sprucing up my own wardrobe without breaking the bank. 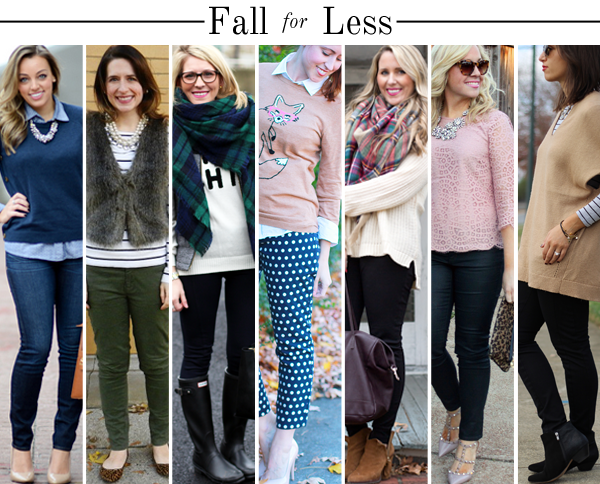 Today I'm excited to team up with 7 other bloggers to show you looks created around budget friendly items. I picked up this Old Navy sweater on super sale & while it probably doesn't help the fact that I am 26 & still get carded for e-v-e-r-ything (including lotto tickets!) I love it & that's what matters in my book! I also got these Forever21 pants for under $20 & was super impressed that they were not only fully lined, made of a thick, rich looking fabric & had the polka dots embroidered on (why I love the LOVE21 line the most!). For an extra $20 I got the waist taken in slightly & the legs tapered at the ankles by my dry cleaners... so $40 later these pants are fun & perfectly tailored for my body! Score! I love this! I'm going to have to order one of those critter sweaters. They're an extra 35% right now! I absolutely love that sweater + those pants are a TOTAL steal. Great look! I am loving those polka dot pants! I'm always a little leery of Forever21 pants, but I'm going to pay more attention the next time I'm in the store! 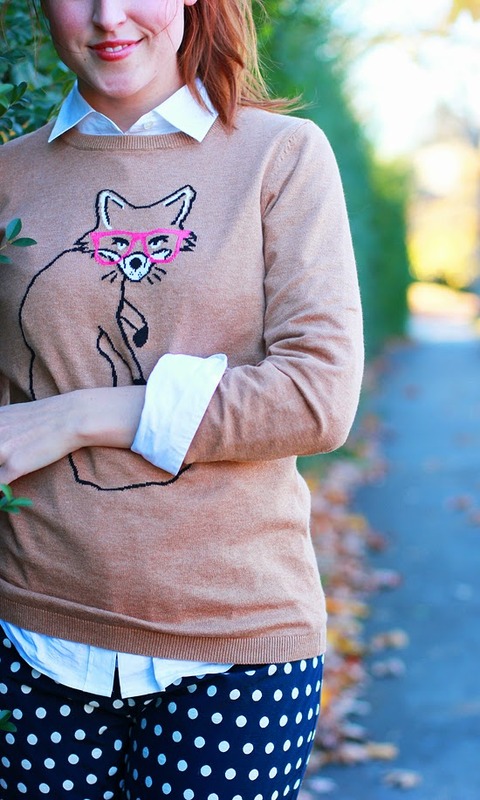 okay i totally love that fox sweater!! so cute! Wow great look and thanks for the idea about getting F21 tailored. I have a hard time sometimes with the sizing. This is such an adorable outfit! The sweater and pants...too cute for words. Love it! I have this sweater, and I absolutely love it! 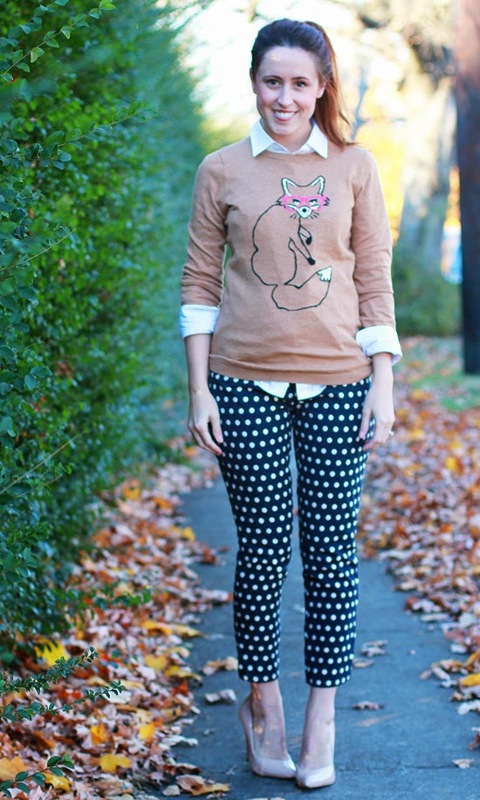 I find quirky animal prints/images so charming, and I love love love how you paired it with the dot pants. So cute! ah that sweater is perfection! I love this outfit! I love how you styled the polka dot pants in particular. I've been trying to get more creative with my own pair. I'm a sucker for polka dot pants (I may have just purchased my 4 pair...)...and paired with the graphic sweater? Love! 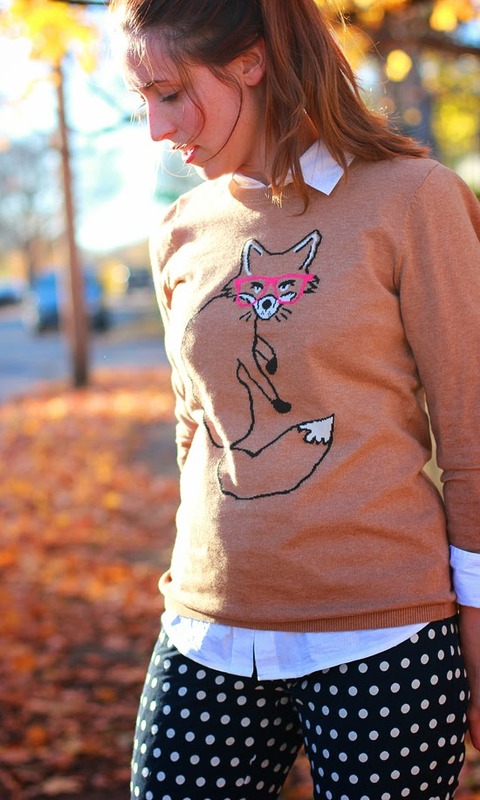 That fox sweater is so stinkin' cute! I know exactly what you mean about reserving my spending money for presents this time of year. Thanks for sharing your tips Jessica! Such a polished look! I've been looking at that sweater myself... maybe I will go for it! I love that sweater! My sister got it for my Mom for her b-day because my mom's nickname in high school was foxy. Love the polka dot pants with it. It was worth the money to get them tailored because they fit you perfectly! I like that you're looking to add a few additions to your wardrobe on a tight budget, I always blow out! Such a cute look! 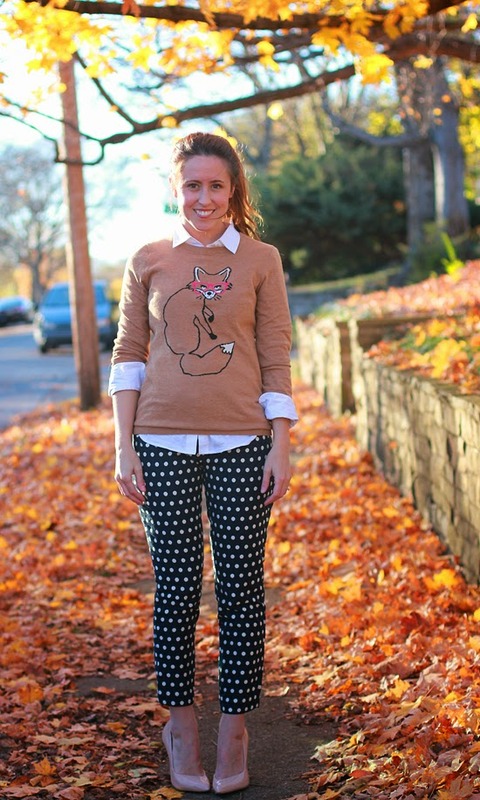 Those polka dot pants are adorable, and I love the fox sweater! that sweat is so cute. what a deal on those pants (LOVE!). so happy we teamed up! hope to do it again soon! Playful, yet feminine look. I love it. Those pants are the cutest thing ever. Love this whole look! So glad we got to do this collab together! What a fun linkup! Love the sweater!! And I really need to find a good tailor so I can have perfectly fitting pants. Super cute, who would not want some critters sweater for sure. The pants looks fabulous on you so the extra cash for alterations really paid off. Such a cute outfit! I would have never guessed those pants were from F21! Great find. Very cute! I love that sweater. It lends itself very well to the dots! Love the sweater, so stinking' adorable!